John Daily, A True Rotarian, An Accomplished Athlete! That's competitive swimming, something that is near and dear to John Daily’s heart. John Daily is a most interesting man, and has lived a most interesting life. I recently had the pleasure of meeting with John for some hours at his home. My purpose was to gather some information regarding his swimming prowess; but, in doing so, I learned so much more. For sure, among John’s accomplishments are those in the area of swimming, but there is much, much more, so I’ll first provide a brief sketch of John’s life. Shortly after John’s birth in Cleveland in December 1927, his family moved to Detroit. The Great Depression soon followed, and, to survive, the family moved to Colorado Springs CO, to Richmond CA, back to Colorado Springs, on to Columbus (where John spent his younger school years through part of grade 3), and finally back to Detroit, where John spent the rest of grade 3 through 12. Upon graduating from high school in January 1946, on the heels of WW II, John enlisted in the Army, where he served 1-1/2 years and was discharged in 1947 as a PFC. John then attended Michigan State College (now Michigan State University), studying Park Management and Municipal Forestry, graduating in 1951 with a Bachelor of Science in Forestry. Along the way, John enrolled in ROTC for his junior and senior years, which seems prescient, as South Korea was invaded in 1950. Upon graduation in 1951, John also received his Army officer commission as a 2d Lt, and served for another 2 years in the Korean War before being discharged as a 1st Lt in 1953. More importantly while at MSC, in 1950 John married his love Ardell, with whom he would spend the next nearly 67 years. Their son Mark was born in the Fort Lee Army hospital in 1952. Their daughter Diane followed in 1960. Through Mark, who lives in Gunnison CO, John has 2 granddaughters and 5 great-grandsons. Through Diane, who lives near St. Louis MO, John has 3 grandsons. Upon his discharge from the Korean War, John returned to Michigan State, where he received his Master of Science degree in Land and Water Conservation in 1954. John’s education at MSC was made possible by the WW II and Korean War GI Bills, as well as a Graduate Tuition Scholarship that John earned. John and his family then moved around for work, and their path to Akron is quite fascinating. John first began with the City and County of Denver Park Department in 1954. In 1955 they relocated to Burlingame CA where John was a structural steel detailing draftsman in his father’s company. Then, in 1956, John landed a job with the Skokie Park District in Illinois, where he oversaw planning, construction and maintenance for 8 years. Later, in a display of serendipity, in 1964, as part of a national search, and identified as a candidate by his earlier MSC mentor, who was then Director of the Akron Metropolitan Park District, John was selected to become his successor, bringing John to Akron for the first time. Despite the Park District’s name, John is quick to point out that the Park District is not connected to any governmental entity, but is an independent creature of the State, governed by its own separate regulations, including a then 3-member (now 5) Board of Commissioners appointed by the Probate Court. John always felt that the inclusion of “Akron” in the District’s name was a misleading, and feels that the later name change to Summit Metro Parks, as the District is now known, is much more sensible. John served as Director of our Park District for 30 years, retiring in 1995 at age 67. At the beginning of John’s tenure as Director, the District included 6 parks. Under John’s direction, additional parks were added, and the parks were further developed to have features that would better attract the public for use. He thoroughly enjoyed working with the various high-level Commissioner appointments made by the Court over the years. In fact, though John had considered retiring at 65, he continued for 2 more years because he so much enjoyed his work. In 1965, the district hired its second long-time director-secretary, John R. Daily, who served until 1995. Under Coup, Wilcox and Daily, the 1960s and ‘70s was a period of much growth and support for the Metro Parks, and during Daily’s 30-year tenure the park system grew to 6,600 acres. That included the additions of Silver Creek, O’Neil Woods, Hampton Hills, the Bike & Hike Trail, the Kniss Conservation Area, Munroe Falls Metro Park and Cascade Valley. Daily also helped acquire lands in the Cuyahoga Valley in the 1960s that later become part of Cuyahoga Valley National Park, saving them from development. Congressman John Seiberling was instrumental in saving the valley, and he was among the first to ride the Bike & Hike Trail when it opened. The 3 initial Commissioners with whom John worked were all Rotarians [Forest Myers (real estate appraiser), Dr. Waldo Seman (Goodrich chemist), Joe Thomas (Firestone officer)], and supported John’s Rotary membership. John was inducted into our Rotary Club in 1966 – 52 years ago. At our meeting on August 28, 2018, John was recognized for 52 years of perfect attendance, an extraordinary expression of John’s dedication to Rotary. Along the way, John has served on the Club Board and Camp Board; is a 5-time Paul Harris Fellow (a member who contributes $1,000 to the Rotary International Foundation); is our Club’s second Arch Klumph Society member (those who have contributed $250,000 or more to Rotary International during their lifetime); drove kids to and from the Camp (back when that was allowed); served as Sergeant-at-Arms for 8 years; helped set up our inaugural Chili Open course at Wingfoot Lake (and has volunteered at most every Chili Open since then); and served as the 2006 Ambassador of Service for the Wayne Homes Chili Open. JOHN IS A TRUE ROTARIAN. John’s swimming experience is nothing short of compelling. He swam competitively in high school (co-captain of the swim team) and in the Army, but his real “career” didn’t start until age 49, when in 1976 Ardell purchased a membership at the Akron Jewish Center “so they could get more exercise.” While swimming at the Center, John’s talent was recognized, and he was approached by an individual who introduced John to U.S. Masters Swimming, which had been formed a few years prior. John participated in his first meet in March 1977 at Branin Natatorium in Canton, and later joined the O*H*I*O Masters Swim Club,. The rest is history, as they say, and what a history it is! I met with John in his office at home. 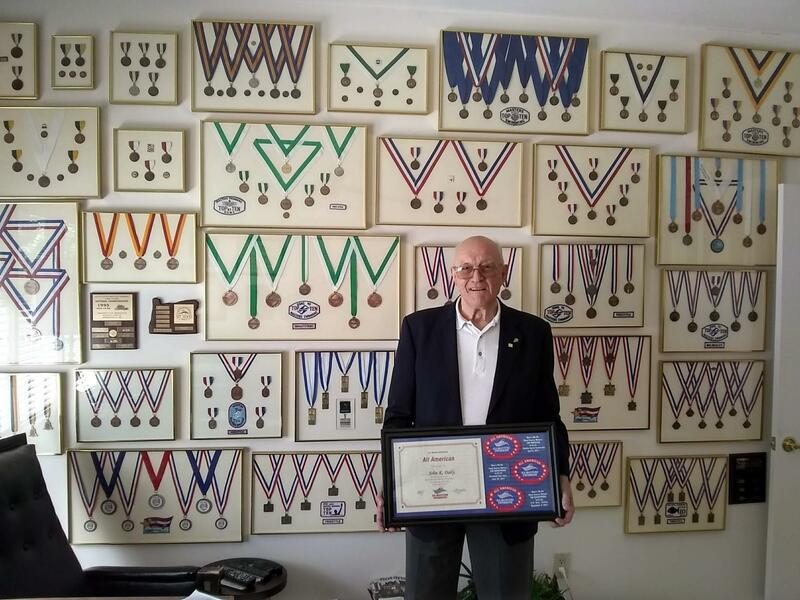 In that room, there is artfully displayed (an Ardell touch) a myriad of medals John has earned over the years. 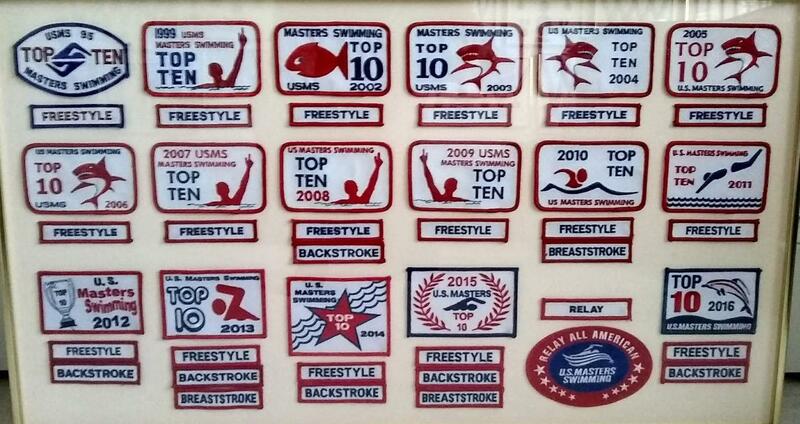 There are awards from U.S. Masters Swimming National Championships, the National Senior Games, Masters YMCA Championships, and World Masters Swimming Championships. One wall is completely dedicated and covered with framed medals. The other 3 walls sport additional framed medals where space allots, and there are unhung frames as well. John has also received awards from numerous local meets that he keeps in a shoebox. I was astounded, and took a few photos. The photo at the beginning of this article features John against the “wall of frames,” holding yet another frame that he explained contains his “Prized Possession.” I was unable to get all of those wall frames in the picture. While many of the frames on the wall contain “Top Ten” patches along with medals, John has a separate framed collection of additional “Top Ten” patches, shown below. One of the functions of U.S. Masters Swimming is to collect the results of all swimming meets (local, regional and national) each year, and then determine the 10 fastest times in the country in each event per age group. This results in the “Top Ten” awards, of which John has dozens. 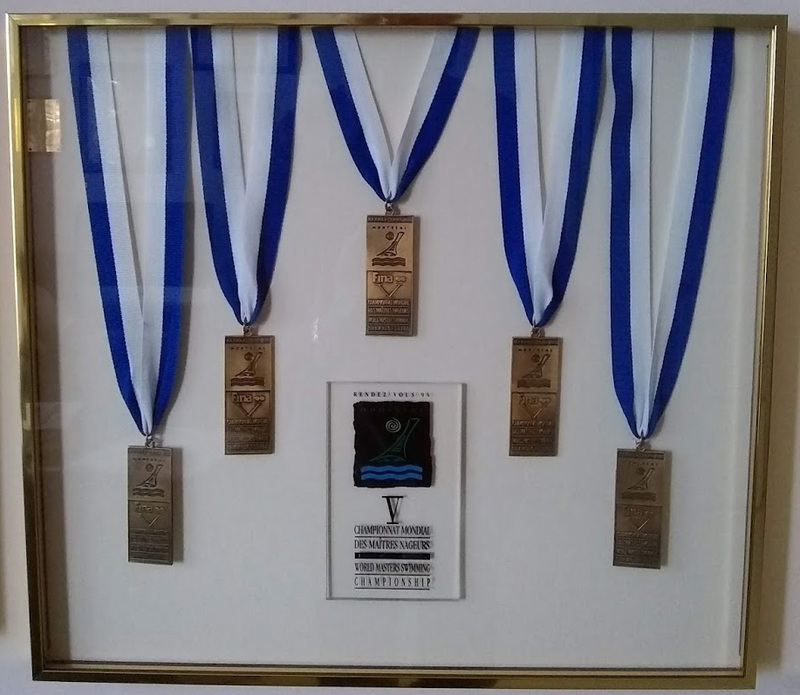 One of the hanging frames contains a collection of 5 medals with blue and white ribbons, which John was awarded at The World Masters Swimming Championship held in Montreal in 1994. For a number of reasons, including hip surgery, John only swam in a few meets during the period 2004-2016, but following Ardell’s unfortunate passing in 2017, John returned to swimming in earnest, immediately collecting more medals in a local meet. 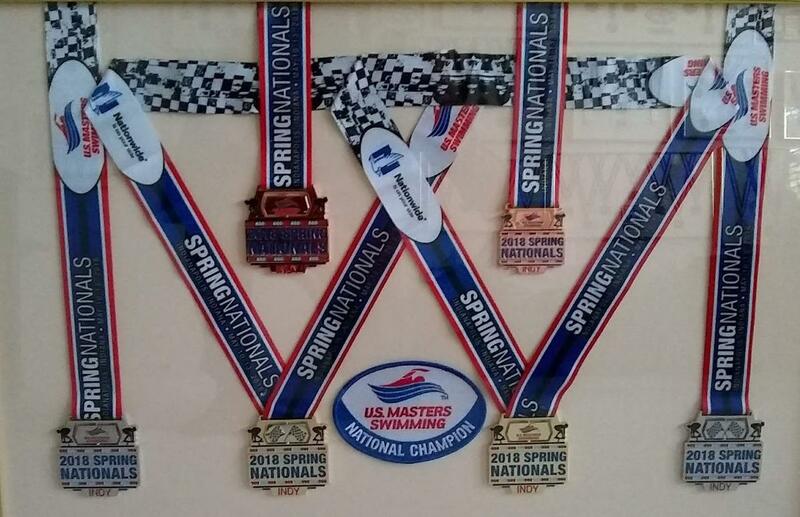 Then, just this year, at the U. S. Masters Swimming Championships (the 2018 Spring Nationals) in Indianapolis, John brought home 5 more medals – 1st place in the 200 yard backstroke; 1st place in the 100 yard backstroke; 2nd place in the 50 yard freestyle; 2nd place in the 100 yard freestyle; 3rd place in the 200 yard medley relay; and 4th place in the 200 yard freestyle relay. An interesting anecdote about the 2 relays is that John swam those in the 75+ age group, competing with and against considerably younger swimmers. John’s recent accomplishments are even more remarkable, considering the impact of his hip replacement. Before the hip replacement, John’s favorite events were the 200 yard breaststroke and the 400 yard individual medley (in which the swimmer swims all four strokes – butterfly, backstroke, breaststroke and freestyle). Following the hip surgery, though, John was unable to perform the breaststroke kick, which took away his 2 preferred events. So John has adjusted, and now swims backstroke and freestyle, with his new favorite event being the 200 meter backstroke. 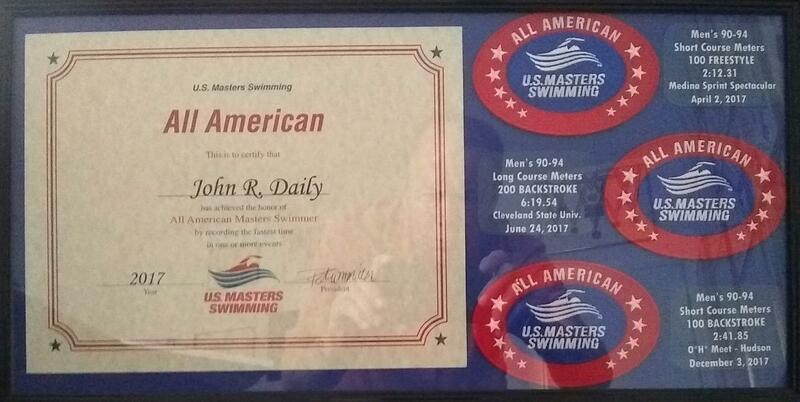 The final individual photograph I took was of John’s “Prized Possession.” That framed collection consists of an All American certificate issued by U. S. Masters Swimming in 2017, along with 3 All American patches – for the 100 meter freestyle; the 200 meter backstroke; and the 100 meter backstroke in John’s age group (90 to 94 years old). These All American awards trump the Top Ten awards, since the All American awards recognize John as having THE FASTEST TIME IN THE COUNTRY in those events for the entire year of 2017 for his age group. And yes, John accomplished that at age 90, which makes it even more remarkable. Significantly, John has every intention to continue his competitive swimming career, and I look forward to being an ongoing fan. Humility defines John. Do not expect him to raise the subject of his swimming prowess. But if you raise it with John, he is willing to discuss his experiences. Such a quiet gentleman. It was truly an honor for me to have spent the better part of an afternoon with such a truly remarkable man.